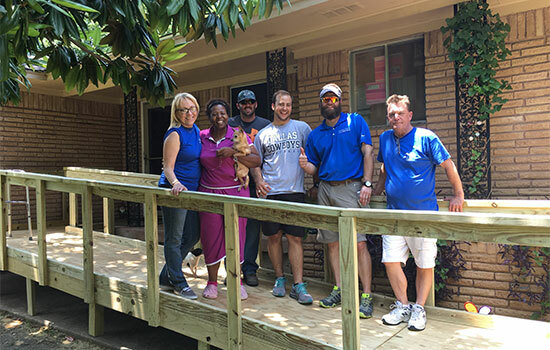 Dallas, TX (June 14, 2016): David Weekley Homes recently partnered with The Texas Ramp Project, an organization that has built more than 10,000 wheelchair ramps since 2006 for elderly and disabled clients. More than 150 Weekley team members in Dallas/Ft. Worth joined together with approximately 200 vendors, trade partners and family members to build a ramp a day throughout the month of May. This project benefited 38 families by providing a ramp for clients to help them be able to leave their homes unassisted. Ten teams were assembled with the goal of completing two ramps a day. The project included donations of nearly $3,000 in materials and more than 1,100 volunteer hours. In addition, two complete sets of tools and trailers were also donated to the organization to assist with future projects. Vendor and trade partners that donated time, money and materials to work with the Weekley Team Members include 84 Lumber, Arrowhead Manufacturing Company, Wholesale Roofing Supply, Acme Brick and Suncoast Post Tension. The project was an initiative of the company’s CARE program, which is a charitable and volunteer program that partners team members with homeowners, homebuyers and community partners with nonprofits to make a positive impact in the lives of everyone it touches and in all the communities it builds through its purpose, Building Dreams, Enhancing Lives. This is accomplished by company team members volunteering countless hours to different organizations in their communities and by The David Weekley Family Foundation donating more than $100 million to a variety of organizations through the U.S. and abroad over the past 20 years. David Weekley Homes, the nation’s largest privately-held home builder, is celebrating its 40th anniversary in 2016. Headquartered in Houston, the company operates in 24 cities and 13 states across the United States. David Weekley Homes was the first builder in the United States to be awarded the Triple Crown of American Home Building, an honor which includes “America’s Best Builder,” “National Housing Quality Award” and “National Builder of the Year.” David Weekley Homes has also appeared 10 times on FORTUNE magazine’s “100 Best Companies to Work For®” list. Since 1976, the company has closed more than 80,000 homes. For more information, visit www.davidweekleyhomes.com. David Weekley Homes team members pose with a client on one of the 38 new ramps built for The Texas Ramp Project.